Rise of Mahayana and Development of Art (Gandhara, Mathura and other Schools). Mahayana Buddhism is sometimes called Northern Buddhism. It is mainly followed by monks and nuns, and is largely found throughout China, Japan, Korea, Mongolia, Nepal, Russia, Tibet, and Vietnam. The reign of Kanishka is known for the rise of the new cult of Buddhism known as the Mahayana cult or sect. There were any causes which were responsible for the rise of Mahayana Buddhism. First the old form of Buddhism, known as the Hinayana Buddhism, had now become quite out-of-date. It was based on icy idealism and lacked realism. It had no emotional appeal. Its chief doctrines of self-suffering, non-violence and self-discipline were too difficult to be followed by common people. So the need of some sort of reformed religion as keenly felt by the people. Secondly, Hinayana Buddhism sect was mean to suit the Indian nationality alone but it could not serve the purpose of Kanishka’s subjects which were composed of different nationalities. To them a religion based on a personal God, devotion and faith had a greater appeal. Thirdly, with the fall of the Magadhan Empire, Pataliputra the seat of Buddhist orthodoxy, lost much of its importance and became only a secondary city in India. Without this decrease in the importance of Pataliputra, the rise of a new cult in Buddhism would have become very difficult. Fourthly, a dispute over many doctrines of Buddhism had lately become so acute that it required an immediate settlement. Keeping all these things in view Kanishka called a Buddhist council, the fourth of its kind, at Kundalvana, near Srinagar in Kashmir. It was attended by about 500 monks and scholars on the Buddhist theology. The chief among them were Vasumitra, Asvaghosa, Nagarjuna and Parshva. It is generally believed that Vasumitra was the President and Asvaghosa was the Vice-President of this Council. Two important results were achieved in this Council. One was the writing of commentaries on the sacred Buddhist texts” The Tripitakas.” Most of these commentaries were compiled in a book-form known as “Mahavibhasha”, which is generally regarded as the Encyclopedia of Buddhism. The other was the division of the Buddhist Church into two sects—the Hinayana Buddhism and the Mahayana Buddhism. The Mahayana sect was recognized at the state religion by Kanishka. Mathura and Gandhara also strongly influenced each other. During their artistic florescence, the two regions were even united politically under the Kushans, both being capitals of the empire. 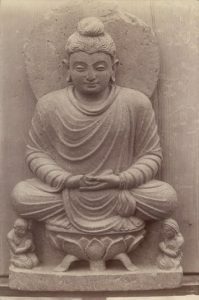 The rise of Mahayana system of Buddhism during the Kushana rule provided golden opportunity to the Mathura artists to show their talent in creation of Buddhist images and icons. In that work they did not need foreign influence like the Gandhara artists. The Mathura school of art developed on Indian traditions. Instead of looking at Greek sculptures for inspiration, the Mathura sculptors developed their own distinct style of work. They found enough material from Buddhist Jataka storeis, from the life-events of Gautama Buddha, from his divine birth, renunciation, enlightenment, sermons at many places, and his Mahaparinirvana. Since Mathura was within the Kushana Empire, the scupltors who were known as the Salia-Rupakaras received enough of royal patronage. They met the royal demand and requirement of outside countries by carving countless images of Buddha. Those images presented divine attributes of the Lord in various mudras like the famous Abhaya-Mudra of Buddha. Bodhisattva images also received Indian traditional faith as expected of divinities. The Gandhara school of Art did not stop only with Buddhist images. From traditional Brahmanical faith, the artists carved out images of Kubera, and of Yakshas, Yakshinis and Nagas. Side by side, they also carved out Brahmanical and Jaina divinities. They also constructed stone railings, female figures and decorative stone panels with floral designs. Besides religious sculptures, the Gandhara School of Art carved secular statues according to need. The finest example of this art is seen in the life-size statue of Kushana Emperor Kanishka. The King stands in royal posture with majestic dignity. His robes were typical of the Kushana era. The legacy of the Mathura art reached its culminating height during the Gupta Era which saw a puranic religious revival. Mathura School: No foreign Influence, however, later it cross fertilized with the Gandhara School. Its development took place indigenously. Gandhara School: Strong Greek influence. Was based on Greco-Roman norms encapsulating foreign techniques and an alien spirit. It is also known as Graeco-Buddhist School of art. Initially inspired by Yaksha Images Assimilating various traits of Acamenian, Parthian and Bactrian traditions into the local tradition is a hallmark of the Gandhara style. Initially inspired by Hellenistic features. Mathura School: Early period: Light volume having fleshy body. 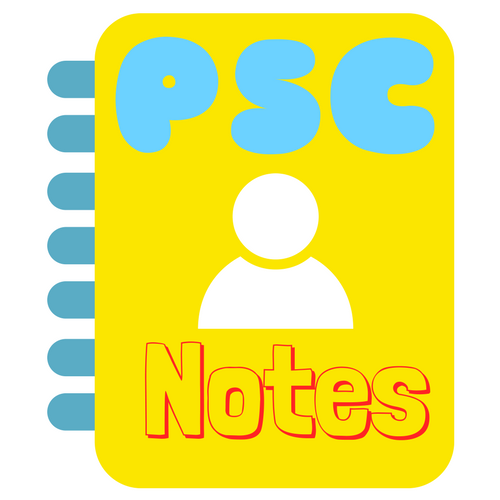 Later Period:Flashiness reduced. Buddha carved out in various Mudras. Not much attention to detailed sculpting. Buddha is stout. Gandhara School: Finer details and realistic images. 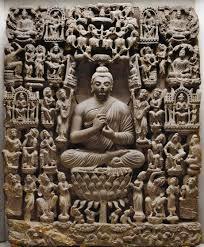 Buddha carved out in various Mudras. Curly hair, anatomical accuracy, spatial depth, and foreshortening. Buddha is sometimes thin. Mathura School: The halo around the head of Buddha was profusely decorated. Images are less expressive. Gandhara School: Not decorated, generally.The images are very expressive. In Amaravati, situated in the eastern Deccan, Andhra Pradesh, a different type of art form evolved and flourished for nearly six centuries commencing from 200-100 BC. Patronized first by the Satavahanas and later by the Ikshvakus and also by other groups. The Amaravati school of art occupies a pre-eminent position in the history of Indian Art. With its beginning in 3rd century BC the Amaravati unfolds its chapters through the galaxy of sculptural wealth that designed the Mahachaityas. The lotus and the purnakumbha motifs are typical of Amaravati Art expressing auspiciousness and abundance. White Marble was used in this art and the themes were Buddha’s life and Jatakas tales. The curly hairs of Buddha is a feature that is influenced by the Greeks. In this school, the Kings, Princes, Palaces etc. have got prominence.